Almost exactly two years ago to the day, we got our first look at Parrot's AR.Drone quadricopter—the coolest flying toy we'd ever seen. 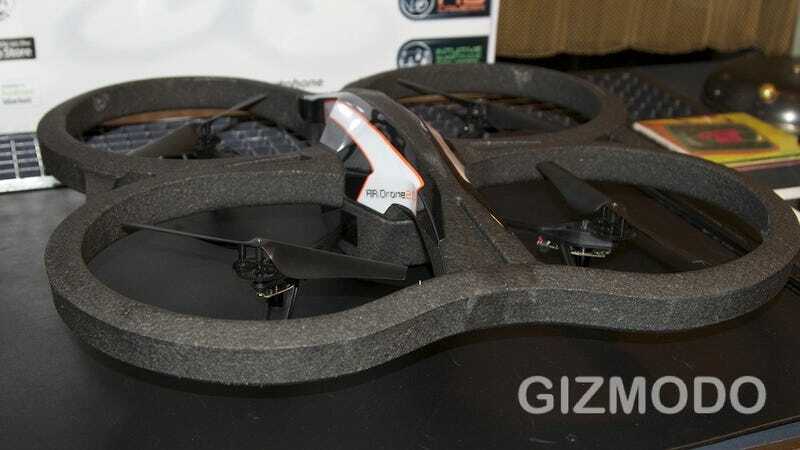 Well we just got our first look at the AR.Drone 2.0, and it's gotten even cooler. For starters that little camera on board is now beaming video and photos back to your device in full 720p HD. The updated app makes it easier to record these videos and share them with your friends. That's right, I said app. In case you don't remember, the original AR.Drone was controlled by iPhone. The app that launches along side version 2.0 will support virtually every iOS and Android phone and tablet you can think of. The craft's body has been redesigned, making it stronger while still keeping it light. It's also way more stable thanks in part to dual ultrasound sensors that "see" the ground sort of like a bat and keep the craft flat when under 6 meters (~18 feet). For higher flights it now has a pressure sensor for greater vertical stability. It'll only go as far as your mobile device's Wi-Fi can reach, but in theory, it could go as high as 50 meters (~160 feet). Perhaps best of all, it's now even easier to pilot. Before you had to rely on the camera to know which way the AR.Drone was facing, and then send commands from the drone's perspective. That option is still available for advanced users, but the AR.Drone 2 now senses where you are, so tilting your phone/tablet away from you will send the drone away, and tilting it to your right will make the drone go that way, too. It's incredibly intuitive. We got some hands-on time with it and we couldn't believe how easy it was to gently maneuver it around a room, carefully weaving around people will cocktails and hors d'oeuvres. The AR.Drone 2.0 will be available sometime in Q2 of this year for an MSRP of $300. Yeah, that's expensive for a toy, but there are a lot of less cool toys that cost a lot more. We can't wait to terrorize our pets with this thing.